Thank you! Your support is awesome and you are awesome. A dollar a month gets you access to my weekly Patreon art blog, which includes work-in-progress posts, early access to comic pages, and other fun stuff. 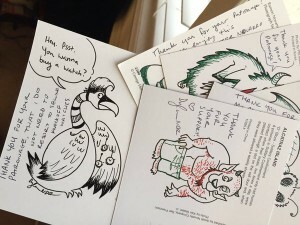 You get a postcard in the mail once a month, upon which I shall draw a doodle, and access to the weekly art blog. Okay. You are pretty awesome, you know that? You will get: art blog access, the monthly postcard doodle, and Some Other Cool Thing at your discretion (for example: original comic art, character sketches, or a cameo in a crowd scene).